Is there anyway I can make the screen smaller? Really cool! Master of any deck! can you add the Wicked Gods into the game? Really good, Percy, Like awalys. There is a hope for "After Glow" Card? After Glow is too broken. Mill all deck. activate it. Play it next tun, gg. I have to agree that the ability to resize the window would be extremely convenient. Percy, how can i solve this problem? Percy, any chance I can have a chat to you at some point? if so you can find me at yugioh-colosseum.com Private message "Monkey Boy" there. Thanks mate. hope to hear from you soon! What does your deck look like? Does it have at least 40 cards in the main? When will you update to 2023? Yes, 40 cards just like in your recipe. I realize you've been awfully busy, but I was wondering if you could please post some of your older decks not mentioned prior to YGOPro's inception. 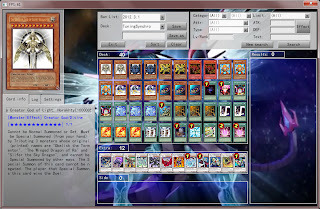 The Grannel Exceed Infinity build, the Psychic Gatling Ogre build, and anything else you didn't post on a blog or show in the 2010 recipe video. If you need me to specify, please don't hesitate to ask. I would greatly appreciate it, thank you. hi percy can i publish a custom version of your game with a lot of new cards ? Time Lords will be added in the new version? Level Eater Does not Work. Please can you put the decks to download? It would be easier for us to use the decks instead of search a card by a card. PD: Continue the great work. try one monster gate ! is basicaly a free obelisk or ra or sliffer. Tem como eu mesmo adicionar cartas que eu quero no yugioh pro? Could you please give me the name of the song that plays in this video, please?